This includes any coporate activity within the last 5 years involving more than $5000 where I have a personal or professional interest or any role in which I have corporate responsibility. Corporate research funding (unrestricted): Intel, NVIDIA, Adobe, Facebook, and Amazon. Financial interests (stock): Amazon, Meshcapade. Commercial licensing of MPI technology where I am a co-inventor. Side employment: Amazon (20%, current), Body Labs Inc (20%, 2013-2017). Corporate boards: Body Labs Inc. (2013-2017). Michael J. Black received his B.Sc. from the University of British Columbia (1985), his M.S. from Stanford (1989), and his Ph.D. in computer science from Yale University (1992). After research at NASA Ames and post-doctoral research at the University of Toronto, he joined the Xerox Palo Alto Research Center in 1993 where he later managed the Image Understanding Area and founded the Digital Video Analysis group. From 2000 to 2010 he was on the faculty of Brown University in the Department of Computer Science (Assoc. Prof. 2000-2004, Prof. 2004-2010). He is a founding director at the Max Planck Institute for Intelligent Systems in Tübingen, Germany, where he leads the Perceiving Systems department. He is also a Distinguished Amazon Scholar, an Honorarprofessor at the University of Tuebingen, and Adjunct Professor at Brown University. Black is a foreign member of the Royal Swedish Academy of Sciences. He is a recipient of the 2010 Koenderink Prize for Fundamental Contributions in Computer Vision and the 2013 Helmholtz Prize for work that has stood the test of time. His work has won several paper awards including the IEEE Computer Society Outstanding Paper Award (CVPR'91). His work received Honorable Mention for the Marr Prize in 1999 and 2005. His early work on optical flow has been widely used in Hollywood films including for the Academy-Award-winning effects in “What Dreams May Come” and “The Matrix Reloaded.” He has contributed to several influential datasets including the Middlebury Flow dataset, HumanEva, and the Sintel dataset. Black has coauthored over 200 peer-reviewed scientific publications. He is also active in commercializing scientific results, is an inventor on 10 issued patents, and has advised multiple startups. He uniquely combines computer vision, graphics, and machine learning to solve problems in the clothing industry. In 2013, he co-founded Body Labs Inc., which used computer vision, machine learning, and graphics technology licensed from his lab to commercialize "the body as a digital platform." Body Labs was acquired by Amazon in 2017. 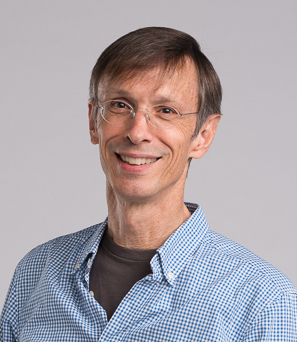 Black's research interests in machine vision include optical flow estimation, 3D shape models, human shape and motion analysis, robust statistical methods, and probabilistic models of the visual world. In computational neuroscience his work focuses on probabilistic models of the neural code and applications of neural decoding in neural prosthetics. Michael Black received his B.Sc. from the University of British Columbia (1985), his M.S. from Stanford (1989), and his Ph.D. from Yale University (1992). After post-doctoral research at the University of Toronto, he worked at Xerox PARC as a member of research staff and area manager. From 2000 to 2010 he was on the faculty of Brown University in the Department of Computer Science (Assoc. Prof. 2000-2004, Prof. 2004-2010). He is one of the founding directors at the Max Planck Institute for Intelligent Systems in Tübingen, Germany, where he leads the Perceiving Systems department. He is also a Distinguished Amazon Scholar, an Honorarprofessor at the University of Tuebingen, and Adjunct Professor at Brown University. His work has won several awards including the IEEE Computer Society Outstanding Paper Award (1991), Honorable Mention for the Marr Prize (1999 and 2005), the 2010 Koenderink Prize for Fundamental Contributions in Computer Vision, and the 2013 Helmholtz Prize for work that has stood the test of time. He is a foreign member of the Royal Swedish Academy of Sciences. In 2013 he co-founded Body Labs Inc., which was acquired by Amazon in 2017. Michael Black received his B.Sc. from the University of British Columbia (1985), his M.S. from Stanford (1989), and his Ph.D. from Yale University (1992). He has held positions at the University of Toronto, Xerox PARC, and Brown Unviversity. He is one of the founding directors at the Max Planck Institute for Intelligent Systems in Tübingen, Germany, where he leads the Perceiving Systems department. He is a Distinguished Amazon Scholar, an Honorarprofessor at the University of Tuebingen, and Adjunct Professor at Brown University. His work has won several awards including the IEEE Computer Society Outstanding Paper Award (1991), Honorable Mention for the Marr Prize (1999 and 2005), the 2010 Koenderink Prize, and the 2013 Helmholtz Prize. He is a foreign member of the Royal Swedish Academy of Sciences. In 2013 he co-founded Body Labs Inc., which was acquired by Amazon in 2017. B.Sc., Honours Computer Science, 1985. University of British Columbia, Department of Computer Science, 2018. Foreign member, Class for Engineering Sciences, since June 2015.
for the paper: Black, M. J., and Anandan, P., "A framework for the robust estimation of optical flow,'' IEEE International Conference on Computer Vision, ICCV, pages 231-236, Berlin, Germany. May 1993.
with Sidenbladh, H. and Fleet, D. J. for the paper "Stochastic tracking of 3D human figures using 2D image motion,'' European Conference on Computer Vision, 2000. Best Paper Award, Eurographics 2017, for the paper "Sparse Inertial Poser: Automatic 3D Human Pose Estimation from Sparse IMUs", by von Marcard, T., Rosenhahn, B., Black, M. J., Pons-Moll, G.
"Dataset Award" at the Eurographics Symposium on Geometry Processing 2016, with F. Bogo, J. Romero, and M. Loper, for the paper "FAUST: Dataset and evaluation for 3D mesh registration," CVPR 2014. Best Paper Award, International Conference on 3D Vision (3DV), 2015, with A. O. Ulusoy and A. Geiger, for the paper "Towards Probabilistic Volumetric Reconstruction using Ray Potentials." with S. Roth for the paper "Steerable random fields." County of Henrico, Virginia, April 19, 2007. University of Maryland, Invention of the Year, 1995, "Tracking and Recognizing Facial Expressions,'' with Y. Yacoob. University of Toronto, Computer Science Students' Union Teaching Award for 1992-1993. 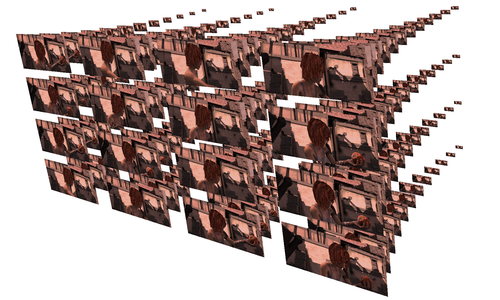 My research addressed the problem of estimating and explaining motion in image sequences. I developed methods detecting and tracking 2D and 3D human motion including the introduction of particle filtering for 3D human tracking and belief propagation for 3D human pose estimation. I worked on probabilistic models of images include the high-order Field of Experts model. I worked on 3D human shape estimation from images and video and developed applications of this technology. I also developed mathematical models for decoding neural signals. This included the first uses of particle filtering and Kalman filtering for decoding motor cortical neural activity and the first point-and-click cortical neural brain-machine-interface for people with paralysis. Research included modeling image changes (motion, illumination, specularity, occlusion, etc.) in video as a mixture of causes. I developed methods of motion explanation; that is, the extraction of mid-level or high-level concepts from motion. This included the modeling and recognition of motion "features" (occlusion boundaries, moving bars, etc. 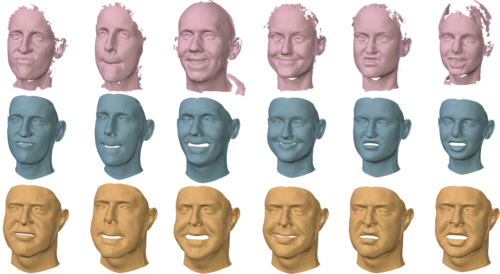 ), human facial expressions and gestures, and motion "texture" (plants, fire, water, etc.). I applied these methods to problems in video indexing, motion for video annotation, teleconferencing, and gestural user interfaces. Other research included robust learning of image-based models, regularization with transparency, anisotropic diffusion, and the recovery of multiple shapes from transparent textures. Assistant Professor, Department of Computer Science, (8/92 - 9/93). Research included the application of mixture models to optical flow, detection and tracking of surface discontinuities using motion information, and robust surface recovery in dynamic environments. Research Assistant, Department of Computer Science. Research in the recovery of optical flow, incremental estimation, temporal continuity, applications of robust statistics to optical flow, the relationship between robust statistics and line processes, the early detection of motion discontinuities, and the role of representation in computer vision. Visiting Researcher, Aerospace Human Factors Research Division. Developed motion estimation algorithms in the context of an autonomous Mars landing and nap-of-the-earth helicopter flight and studied the psychophysical implications of a temporal continuity assumption. Computer Scientist, Image Understanding Group. Research on spatial reasoning for robotic vehicle route planning and terrain analysis. Vision research including perceptual grouping, object-based translational motion processing, the integration of vision and control for an autonomous vehicle, object modeling using generalized cylinders, and the development of an object-oriented vision environment. Developed expert systems for multi-source data fusion and fault location. Summer undergraduate researcher at UBC; park ranger's assistant; volunteer firefighter, busboy; and probably my worst job: cleaning dog kennels. I am interested in motion. What does motion tell us about the structure of the world and how can we compute this from video? How do humans and animals move? How does the brain control complex movement? My work combines computer vision, graphics and neuroscience to develop new models and algorithms to capture and analyze the motion of the world. capture and animation of clothing. What is maybe unique about my work is the combination of the these themes. For example I study human motion from the inside (decoding neural activity in paralyzed humans) and the outside (with novel motion capture techniques). Thesis: Statistical models of neural coding in motor cortex, Division of Applied Math, Brown University. Co-supervised with David Mumford. May 2004. Alejandra Quiros-Ramirez, MPI for Intelligent Systems, May 2015 - Nov. 2017. Laura Sevilla, Lecturer Reader in Image and Vision Computing, University of Edinburgh. Ali Osman Ulusoy, (jointly with A. Geiger), Microsoft. Federica Bogo, Microsoft Research, Cambridge. Gerard Pons-Moll, Research Scientist, MPI for Informatik. Ijaz Akhter, postdoctoral researcher, Australia Nationa University, Canbera. Silvia Zuffi, Research Scientist, IMATI-CNR, Institute for Applied Mathematics (Milano). Si Yong Yeo, Scientist, A*Star, Singapore. Søren Hauberg, Associate Professor, Technical University of Denmark (DTU), Copenhagen. Gregrory Shakhnarovich, Associate Professor, Toyota Technological Institute at Chicago. Sung-Phil Kim, Associate Professor, School of Design and Human Engineering, UNIST, Korea. Ronan Fablet, Professor, Telecom Bretange. I belive that computer vision is advanced by careful evaluation and comparison. Consequently I have been involved in building several public datasets and evaluation websites. 3D human scans of multiple people in multiple poses with accurate ground truth correspondences: FAUST site. Optical flow benchmark based on the animate film Sintel: MPI-Sintel site. Annotated videos for action recognition: JHMDB site. Image sequences, ground truth flow, and evaluation are all available on the Middlebury Flow site. Multi-camera imagery with ground truth 3D human pose: HumanEva site. Multi-camera imagery with ground truth 3D human pose. This predates HumanEva and the imagery is grayscale only. There is also software for partical filter tracking on the site. My old Brown site has several image sequences used in my older publications. These include some classic sequences such as Yosemite, the Pepsi can, the SRI tree sequence, and the Flower Garden sequence. Sun, D., Roth, S., and Black, M.J.
International Journal of Computer Vision (IJCV), 106(2):115-137, 2014. IEEE Conf. on Computer Vision and Pattern Recog., CVPR, June 2010. This method implements many of the currently best known techniques for accurate optical flow and was once ranked #1 on the Middlebury evaluation (June 2010). The software is made available for research pupropses. Please read the copyright statement and contact me for commerical licensing. The method in 1 above is more accurate and also implements Black and Anandan plus much more. The optical flow software here has been used by a number of graphics companies to make special effects for movies. This software is provided for research purposes only; any sale or use for commercial purposes is strictly prohibited. Contact me for the password to download the software, stating that it is for research purposes. Please contact me if you wish to use this code for commercial purpose. If you are a commercial enterprise and would like assistance in using optical flow in your application, please contact me at my consulting address black@opticalflow.com. This is EXPERIMENTAL software. It is provided to illustrate some ideas in the robust estimation of optical flow. Use at your own risk. No warranty is implied by this distribution. Area-based optical flow: robust affine regression. 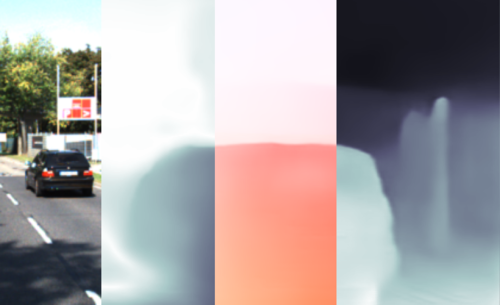 Dense optical flow: robust regularization. Computer Vision and Image Understanding, CVIU, 63(1), pp. 75-104, Jan. 1996. Software is from the ICCV'2001 paper with Fernando De la Torre. 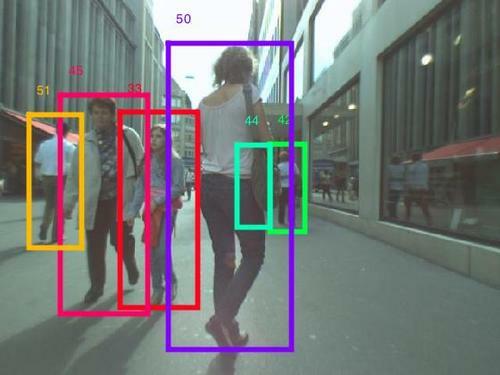 The code below provides a simple Matlab implementation of the Bayesian 3D person tracking system described in ECCV'00 and ICCV'01. It is too slow to be used to track the entire body but can be used to track various limbs and provides a basis for people who want to understand the methods better and extend them. Int. Conf. on Computer Vision, ICCV-2001, Vancouver, BC, Vol. II, pp. 709-716. European Conference on Computer Vision, D. Vernon (Ed. ), Springer Verlag, LNCS 1843, Dublin, Ireland, pp. 702-718 June 2000. Werner Reichardt Center for Integrative Neuroscience, Eberhard Karls Universität Tübingen, Member since 2011. Bernstein Center for Computational Neuroscience, Tübingen, since Jan. 2011. For more information including our address and directions, see the department CONTACT page. If you have asked me to do something (like review a paper or grant proposal), and I haven't responded saying that I can do it, then I have not agreed to do it. My assistant reads mail sent to me at black@is.mpg.de. If you have something particularly private, you can email me at black@cs.brown.edu and only I will read it. What is optical flow for? On prediction, persistence and structure. Workshop on What is Optical Flow For? ECCV, Munich, Sept. 2018. The Future and Generative Models: A Case Study of Human Bodies in Motion. 2-hour course given at the Int. Computer Vision Summer School, July 2016. An overview of our work on 3D body shape, based on a series of talks during 2015. Animation Studies Summer School, Tübiungen, 2015. 12th IEEE Int. Conf. on Advanced Video and Signal-based Surveillance, AVSS, Karlsruhe, Germany, Aug. 2015. Kinovis Inaugural Workshop, INRIA Rhone-Alps, Grenoble, 2015. Int. Conf. on Robotics and Automation (ICRA), Karlsruhe, Germany, May 2013. Keynote, Svenska Sällskapet för Automatiserad Bildanalys (Swedish Society for Automated Image Analysis, SSBA), KTH, Stockholm, March 2012. Keynote, Vision, Modeling and Visualization Workshop, October 4-6, 2011, Berlin. Keynote, International Workshop on Human Activity Understanding from 3D Data, Colorado Spring, June 24, 2011. 9th Int. Workshop on Human Behavior Understanding. at ECCV, Sept. 2018. Shape Analysis and Learning by Geometry and Machine Inst. for Pure and Applied Mathematics (IPAM), UCLA, Feb. 2016. Inverse Rendering Workshop, ICCV, Santiago Chile, Dec. 2015. Machine Learning Summer School, Tübingen, July 2015. Science Notes, WAHRnehmung, Tübingen, May 7, 2015. FMX, Conference on Animation, Effects, Games and Transmedia, Stuttgart, Germany, May 05-08, 2015. First Int. 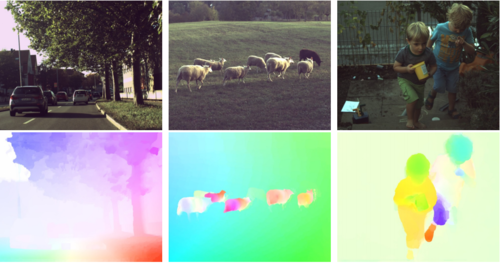 Workshop on Video Segmentation, with ECCV'14, Zürich, Sept. 2014. 4th Int. Workshop on Computer Vision, Alghero, Italy, May 2014. ETH/MPI Research Network on Learning Systems, Summer School, Zürich, June 2014,. Machine Learning Summer School (MLSS), Tübiungen, 2013. ECCV 2012 Workshop on Unsolved Problems in Optical Flow and Stereo Estimation, Oct. 12, Florence Italy. Sensory Coding & Natural Environment, IST Austrial, Sept. 2012. At the intersection of Vision, Graphics, Learning and Sensing - Representations and Applications Workshop, Cambridge, May 2012. Inaugural Symposium: New Perspectives in Integrative Neuroscience, Hertie Institute, Tübingen, May 2012. Grasmere, UK, March 26-29, 2012. Bernstein Cluster C Symposium, Bayesian Inference: From Spikes to Behaviour, Tübingen, December 9-10, 2011. Technion Computer Engineering (TCE) Inaugural Conference, Haifa, Israel, June 1-5, 2011. CIN-MPI Body Perception seminar, Tübingen, July 2012. Gatsby Computational Neuroscience Unit, Univ. College, London, Jan. 2012. Oxford University, Robotics Research Group Seminar, Jan. 2012. Wilhelm Schickhard Institute for Computer Sciences, Eberhard Karls University, Tübingen, Germany, July 2011. Jointly with Chris Lane, CEO 3dMD LLC. 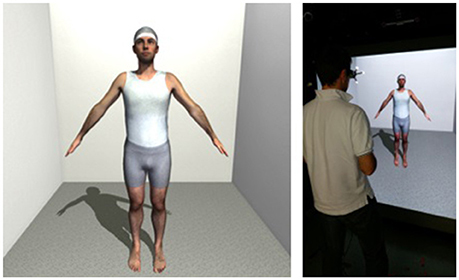 3rd International Conference and Exhibition on 3D Body Scanning Technologies, Lugano, Switzerland, 16-17 October 2012. Hasson, Y., Varol, G., Tzionas, D., Kalevatykh, I., Black, M. J., Laptev, I., Schmid, C.
Estimating hand-object manipulations is essential for interpreting and imitating human actions. Previous work has made significant progress towards reconstruction of hand poses and object shapes in isolation. Yet, reconstructing hands and objects during manipulation is a more challenging task due to significant occlusions of both the hand and object. While presenting challenges, manipulations may also simplify the problem since the physics of contact restricts the space of valid hand-object configurations. For example, during manipulation, the hand and object should be in contact but not interpenetrate. In this work, we regularize the joint reconstruction of hands and objects with manipulation constraints. We present an end-to-end learnable model that exploits a novel contact loss that favors physically plausible hand-object constellations. Our approach improves grasp quality metrics over baselines, using RGB images as input. 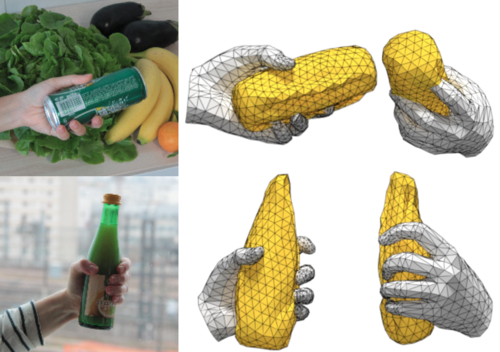 To train and evaluate the model, we also propose a new large-scale synthetic dataset, ObMan, with hand-object manipulations. We demonstrate the transferability of ObMan-trained models to real data. Sanyal, S., Bolkart, T., Feng, H., Black, M.
The estimation of 3D face shape from a single image must be robust to variations in lighting, head pose, expression, facial hair, makeup, and occlusions. Robustness requires a large training set of in-the-wild images, which by construction, lack ground truth 3D shape. To train a network without any 2D-to-3D supervision, we present RingNet, which learns to compute 3D face shape from a single image. Our key observation is that an individual’s face shape is constant across images, regardless of expression, pose, lighting, etc. RingNet leverages multiple images of a person and automatically detected 2D face features. It uses a novel loss that encourages the face shape to be similar when the identity is the same and different for different people. We achieve invariance to expression by representing the face using the FLAME model. Once trained, our method takes a single image and outputs the parameters of FLAME, which can be readily animated. Additionally we create a new database of faces “not quite in-the-wild” (NoW) with 3D head scans and high-resolution images of the subjects in a wide variety of conditions. We evaluate publicly available methods and find that RingNet is more accurate than methods that use 3D supervision. The dataset, model, and results are available for research purposes. Pavlakos, G., Choutas, V., Ghorbani, N., Bolkart, T., Osman, A. A. A., Tzionas, D., Black, M. J. To facilitate the analysis of human actions, interactions and emotions, we compute a 3D model of human body pose, hand pose, and facial expression from a single monocular image. To achieve this, we use thousands of 3D scans to train a new, unified, 3D model of the human body, SMPL-X, that extends SMPL with fully articulated hands and an expressive face. Learning to regress the parameters of SMPL-X directly from images is challenging without paired images and 3D ground truth. Consequently, we follow the approach of SMPLify, which estimates 2D features and then optimizes model parameters to fit the features. We improve on SMPLify in several significant ways: (1) we detect 2D features corresponding to the face, hands, and feet and fit the full SMPL-X model to these; (2) we train a new neural network pose prior using a large MoCap dataset; (3) we define a new interpenetration penalty that is both fast and accurate; (4) we automatically detect gender and the appropriate body models (male, female, or neutral); (5) our PyTorch implementation achieves a speedup of more than 8x over Chumpy. We use the new method, SMPLify-X, to fit SMPL-X to both controlled images and images in the wild. We evaluate 3D accuracy on a new curated dataset comprising 100 images with pseudo ground-truth. This is a step towards automatic expressive human capture from monocular RGB data. The models, code, and data are available for research purposes at https://smpl-x.is.tue.mpg.de. Kenny, S., Mahmood, N., Honda, C., Black, M. J., Troje, N. F.
The individual shape of the human body, including the geometry of its articulated structure and the distribution of weight over that structure, influences the kinematics of a person’s movements. How sensitive is the visual system to inconsistencies between shape and motion introduced by retargeting motion from one person onto the shape of another? We used optical motion capture to record five pairs of male performers with large differences in body weight, while they pushed, lifted, and threw objects. From these data, we estimated both the kinematics of the actions as well as the performer’s individual body shape. 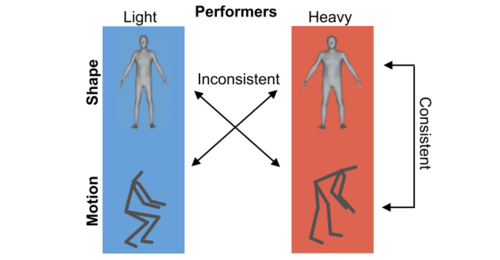 To obtain consistent and inconsistent stimuli, we created animated avatars by combining the shape and motion estimates from either a single performer or from different performers. Using these stimuli we conducted three experiments in an immersive virtual reality environment. First, a group of participants detected which of two stimuli was inconsistent. Performance was very low, and results were only marginally significant. Next, a second group of participants rated perceived attractiveness, eeriness, and humanness of consistent and inconsistent stimuli, but these judgements of animation characteristics were not affected by consistency of the stimuli. Finally, a third group of participants rated properties of the objects rather than of the performers. Here, we found strong influences of shape-motion inconsistency on perceived weight and thrown distance of objects. This suggests that the visual system relies on its knowledge of shape and motion and that these components are assimilated into an altered perception of the action outcome. We propose that the visual system attempts to resist inconsistent interpretations of human animations. Actions involving object manipulations present an opportunity for the visual system to reinterpret the introduced inconsistencies as a change in the dynamics of an object rather than as an unexpected combination of body shape and body motion. Ghosh, P., Losalka, A., Black, M. J.
Susceptibility of deep neural networks to adversarial attacks poses a major theoretical and practical challenge. All efforts to harden classifiers against such attacks have seen limited success till now. Two distinct categories of samples against which deep neural networks are vulnerable, ``adversarial samples" and ``fooling samples", have been tackled separately so far due to the difficulty posed when considered together. In this work, we show how one can defend against them both under a unified framework. Our model has the form of a variational autoencoder with a Gaussian mixture prior on the latent variable, such that each mixture component corresponds to a single class. We show how selective classification can be performed using this model, thereby causing the adversarial objective to entail a conflict. The proposed method leads to the rejection of adversarial samples instead of misclassification, while maintaining high precision and recall on test data. It also inherently provides a way of learning a selective classifier in a semi-supervised scenario, which can similarly resist adversarial attacks. We further show how one can reclassify the detected adversarial samples by iterative optimization. 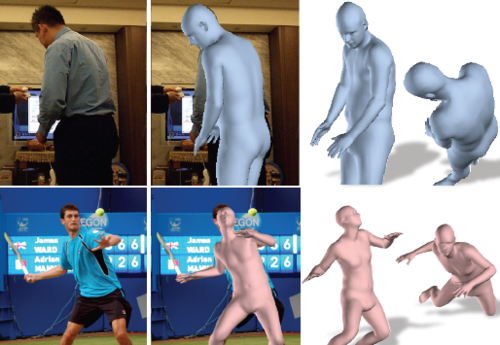 Huang, Y., Kaufmann, M., Aksan, E., Black, M. J., Hilliges, O., Pons-Moll, G.
We demonstrate a novel deep neural network capable of reconstructing human full body pose in real-time from 6 Inertial Measurement Units (IMUs) worn on the user's body. In doing so, we address several difficult challenges. First, the problem is severely under-constrained as multiple pose parameters produce the same IMU orientations. Second, capturing IMU data in conjunction with ground-truth poses is expensive and difficult to do in many target application scenarios (e.g., outdoors). Third, modeling temporal dependencies through non-linear optimization has proven effective in prior work but makes real-time prediction infeasible. To address this important limitation, we learn the temporal pose priors using deep learning. To learn from sufficient data, we synthesize IMU data from motion capture datasets. A bi-directional RNN architecture leverages past and future information that is available at training time. At test time, we deploy the network in a sliding window fashion, retaining real time capabilities. To evaluate our method, we recorded DIP-IMU, a dataset consisting of 10 subjects wearing 17 IMUs for validation in 64 sequences with 330,000 time instants; this constitutes the largest IMU dataset publicly available. We quantitatively evaluate our approach on multiple datasets and show results from a real-time implementation. DIP-IMU and the code are available for research purposes. Sevilla-Lara, L., Liao, Y., Güney, F., Jampani, V., Geiger, A., Black, M. J. 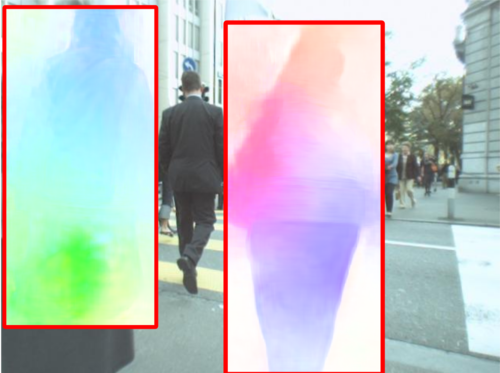 Most of the top performing action recognition methods use optical flow as a "black box" input. Here we take a deeper look at the combination of flow and action recognition, and investigate why optical flow is helpful, what makes a flow method good for action recognition, and how we can make it better. In particular, we investigate the impact of different flow algorithms and input transformations to better understand how these affect a state-of-the-art action recognition method. Furthermore, we fine tune two neural-network flow methods end-to-end on the most widely used action recognition dataset (UCF101). Based on these experiments, we make the following five observations: 1) optical flow is useful for action recognition because it is invariant to appearance, 2) optical flow methods are optimized to minimize end-point-error (EPE), but the EPE of current methods is not well correlated with action recognition performance, 3) for the flow methods tested, accuracy at boundaries and at small displacements is most correlated with action recognition performance, 4) training optical flow to minimize classification error instead of minimizing EPE improves recognition performance, and 5) optical flow learned for the task of action recognition differs from traditional optical flow especially inside the human body and at the boundary of the body. These observations may encourage optical flow researchers to look beyond EPE as a goal and guide action recognition researchers to seek better motion cues, leading to a tighter integration of the optical flow and action recognition communities. Price, E., Lawless, G., Ludwig, R., Martinovic, I., Buelthoff, H. H., Black, M. J., Ahmad, A.
Multi-camera tracking of humans and animals in outdoor environments is a relevant and challenging problem. Our approach to it involves a team of cooperating micro aerial vehicles (MAVs) with on-board cameras only. 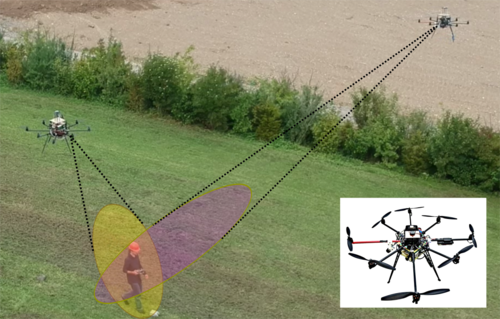 DNNs often fail at objects with small scale or far away from the camera, which are typical characteristics of a scenario with aerial robots. Thus, the core problem addressed in this paper is how to achieve on-board, online, continuous and accurate vision-based detections using DNNs for visual person tracking through MAVs. Our solution leverages cooperation among multiple MAVs and active selection of most informative regions of image. We demonstrate the efficiency of our approach through simulations with up to 16 robots and real robot experiments involving two aerial robots tracking a person, while maintaining an active perception-driven formation. ROS-based source code is provided for the benefit of the community. elds. Using this unsupervised pre-training, our network outperforms similar architectures that were trained supervised using synthetic optical flow. Marcard, T. V., Henschel, R., Black, M. J., Rosenhahn, B., Pons-Moll, G.
ffee or taking the bus. We make the reconstructed 3D poses, video, IMU and 3D models available for research purposes at http://virtualhumans.mpi-inf.mpg.de/3DPW. Gueorguiev, D., Tzionas, D., Pacchierotti, C., Black, M. J., Kuchenbecker, K. J. Little is known about the shape and properties of the human finger during haptic interaction, even though these are essential parameters for controlling wearable finger devices and deliver realistic tactile feedback. This study explores a framework for four-dimensional scanning (3D over time) and modelling of finger-surface interactions, aiming to capture the motion and deformations of the entire finger with high resolution while simultaneously recording the interfacial forces at the contact. Preliminary results show that when the fingertip is actively pressing a rigid surface, it undergoes lateral expansion and proximal/distal bending, deformations that cannot be captured by imaging of the contact area alone. Therefore, we are currently capturing a dataset that will enable us to create a statistical model of the finger’s deformations and predict the contact forces induced by tactile interaction with objects. This technique could improve current methods for tactile rendering in wearable haptic devices, which rely on general physical modelling of the skin’s compliance, by developing an accurate model of the variations in finger properties across the human population. The availability of such a model will also enable a more realistic simulation of virtual finger behaviour in virtual reality (VR) environments, as well as the ability to accurately model a specific user’s finger from lower resolution data. It may also be relevant for inferring the physical properties of the underlying tissue from observing the surface mesh deformations, as previously shown for body tissues. Tallamraju, R., Rajappa, S., Black, M. J., Karlapalem, K., Ahmad, A. 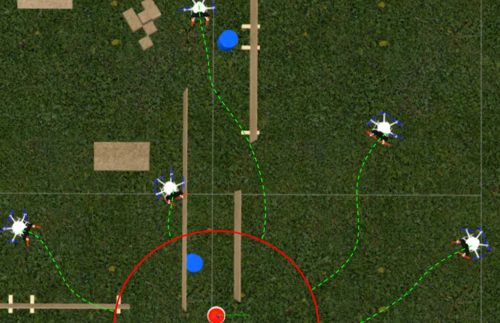 In this work, we consider the problem of decentralized multi-robot target tracking and obstacle avoidance in dynamic environments. Each robot executes a local motion planning algorithm which is based on model predictive control (MPC). The planner is designed as a quadratic program, subject to constraints on robot dynamics and obstacle avoidance. Repulsive potential field functions are employed to avoid obstacles. The novelty of our approach lies in embedding these non-linear potential field functions as constraints within a convex optimization framework. Our method convexifies nonconvex constraints and dependencies, by replacing them as pre-computed external input forces in robot dynamics. The proposed algorithm additionally incorporates different methods to avoid field local minima problems associated with using potential field functions in planning. The motion planner does not enforce predefined trajectories or any formation geometry on the robots and is a comprehensive solution for cooperative obstacle avoidance in the context of multi-robot target tracking. We perform simulation studies for different scenarios to showcase the convergence and efficacy of the proposed algorithm. 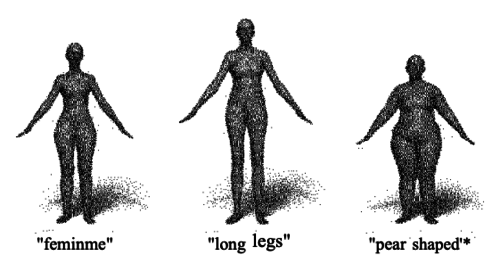 Black, M. J., Balan, A., Weiss, A., Sigal, L., Loper, M., St Clair, T.
A system and method of estimating the body shape of an individual from input data such as images or range maps. The body may appear in one or more poses captured at different times and a consistent body shape is computed for all poses. The body may appear in minimal tight-fitting clothing or in normal clothing wherein the described method produces an estimate of the body shape under the clothing. Clothed or bare regions of the body are detected via image classification and the fitting method is adapted to treat each region differently. Body shapes are represented parametrically and are matched to other bodies based on shape similarity and other features. Standard measurements are extracted using parametric or non-parametric functions of body shape. The system components support many applications in body scanning, advertising, social networking, collaborative filtering and Internet clothing shopping. Little is known about the shape and properties of the human finger during haptic interaction even though this knowledge is essential to control wearable finger devices and deliver realistic tactile feedback. 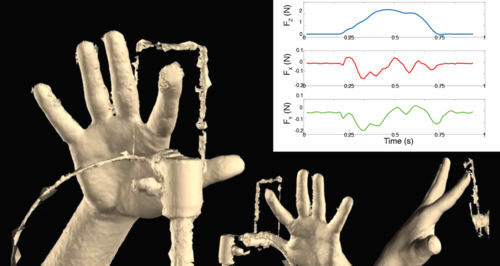 This study explores a framework for four-dimensional scanning and modeling of finger-surface interactions, aiming to capture the motion and deformations of the entire finger with high resolution. The results show that when the fingertip is actively pressing a rigid surface, it undergoes lateral expansion of about 0.2 cm and proximal/distal bending of about 30◦, deformations that cannot be captured by imaging of the contact area alone. This project constitutes a first step towards an accurate statistical model of the finger’s behavior during haptic interaction. Black, M., Hirshberg, D., Loper, M., Rachlin, E., Weiss, A. Present application refers to a method, a model generation unit and a computer program (product) for generating trained models (M) of moving persons, based on physically measured person scan data (S). The approach is based on a common template (T) for the respective person and on the measured person scan data (S) in different shapes and different poses. Scan data are measured with a 3D laser scanner. A generic personal model is used for co-registering a set of person scan data (S) aligning the template (T) to the set of person scans (S) while simultaneously training the generic personal model to become a trained person model (M) by constraining the generic person model to be scan-specific, person-specific and pose-specific and providing the trained model (M), based on the co registering of the measured object scan data (S). Kanazawa, A., Black, M. J., Jacobs, D. W., Malik, J. We describe Human Mesh Recovery (HMR), an end-to-end framework for reconstructing a full 3D mesh of a human body from a single RGB image. In contrast to most current methods that compute 2D or 3D joint locations, we produce a richer and more useful mesh representation that is parameterized by shape and 3D joint angles. The main objective is to minimize the reprojection loss of keypoints, which allows our model to be trained using in-the-wild images that only have ground truth 2D annotations. However, the reprojection loss alone is highly underconstrained. 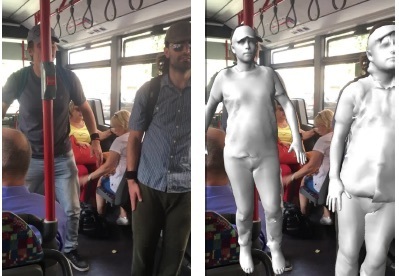 In this work we address this problem by introducing an adversary trained to tell whether human body shape and pose parameters are real or not using a large database of 3D human meshes. We show that HMR can be trained with and without using any paired 2D-to-3D supervision. We do not rely on intermediate 2D keypoint detections and infer 3D pose and shape parameters directly from image pixels. Our model runs in real-time given a bounding box containing the person. 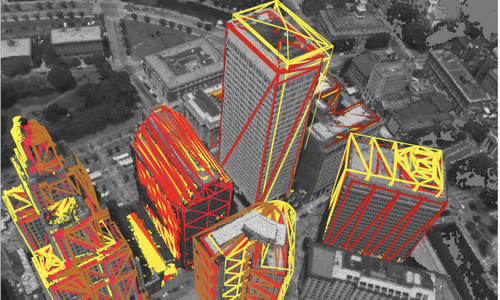 We demonstrate our approach on various images in-the-wild and out-perform previous optimization-based methods that output 3D meshes and show competitive results on tasks such as 3D joint location estimation and part segmentation. Zuffi, S., Kanazawa, A., Black, M. J. Animals are widespread in nature and the analysis of their shape and motion is important in many fields and industries. Modeling 3D animal shape, however, is difficult because the 3D scanning methods used to capture human shape are not applicable to wild animals or natural settings. Consequently, we propose a method to capture the detailed 3D shape of animals from images alone. The articulated and deformable nature of animals makes this problem extremely challenging, particularly in unconstrained environments with moving and uncalibrated cameras. 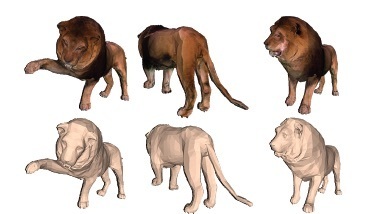 To make this possible, we use a strong prior model of articulated animal shape that we fit to the image data. We then deform the animal shape in a canonical reference pose such that it matches image evidence when articulated and projected into multiple images. Our method extracts significantly more 3D shape detail than previous methods and is able to model new species, including the shape of an extinct animal, using only a few video frames. Additionally, the projected 3D shapes are accurate enough to facilitate the extraction of a realistic texture map from multiple frames. Black, M. J., Freifeld, O., Weiss, A., Loper, M., Guan, P.
Disclosed are computer-readable devices, systems and methods for generating a model of a clothed body. 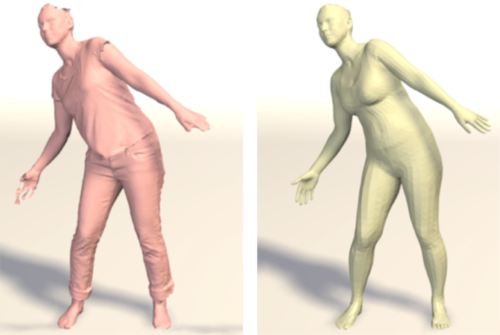 The method includes generating a model of an unclothed human body, the model capturing a shape or a pose of the unclothed human body, determining two-dimensional contours associated with the model, and computing deformations by aligning a contour of a clothed human body with a contour of the unclothed human body. 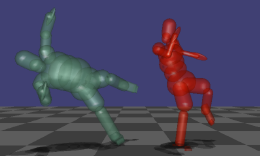 Based on the two-dimensional contours and the deformations, the method includes generating a first two-dimensional model of the unclothed human body, the first two-dimensional model factoring the deformations of the unclothed human body into one or more of a shape variation component, a viewpoint change, and a pose variation and learning an eigen-clothing model using principal component analysis applied to the deformations, wherein the eigen-clothing model classifies different types of clothing, to yield a second two-dimensional model of a clothed human body. The individual shape of the human body, including the geometry of its articulated structure and the distribution of weight over that structure, influences the kinematics of a person's movements. How sensitive is the visual system to inconsistencies between shape and motion introduced by retargeting motion from one person onto the shape of another? 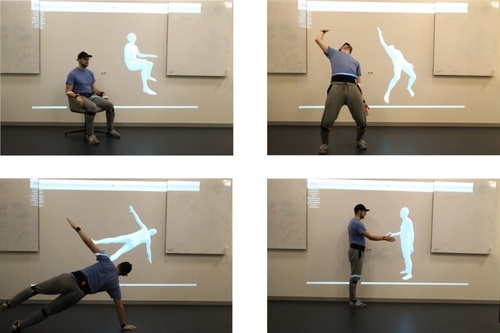 We used optical motion capture to record five pairs of male performers with large differences in body weight, while they pushed, lifted, and threw objects. Based on a set of 67 markers, we estimated both the kinematics of the actions as well as the performer's individual body shape. 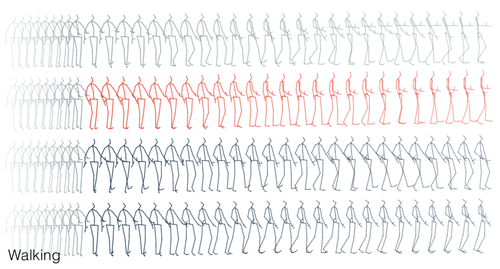 To obtain consistent and inconsistent stimuli, we created animated avatars by combining the shape and motion estimates from either a single performer or from different performers. In a virtual reality environment, observers rated the perceived weight or thrown distance of the objects. They were also asked to explicitly discriminate between consistent and hybrid stimuli. Observers were unable to accomplish the latter, but hybridization of shape and motion influenced their judgements of action outcome in systematic ways. Inconsistencies between shape and motion were assimilated into an altered perception of the action outcome. Streuber, S., Ramirez, M. Q., Black, M., Zuffi, S., O’Toole, A., Hill, M. Q., Hahn, C. A. A method for generating a body shape, comprising the steps: - receiving one or more linguistic descriptors related to the body shape; - retrieving an association between the one or more linguistic descriptors and a body shape; and - generating the body shape, based on the association. Janai, J., Güney, F., Wulff, J., Black, M., Geiger, A. Existing optical flow datasets are limited in size and variability due to the difficulty of capturing dense ground truth. In this paper, we tackle this problem by tracking pixels through densely sampled space-time volumes recorded with a high-speed video camera. Our model exploits the linearity of small motions and reasons about occlusions from multiple frames. Using our technique, we are able to establish accurate reference flow fields outside the laboratory in natural environments. Besides, we show how our predictions can be used to augment the input images with realistic motion blur. We demonstrate the quality of the produced flow fields on synthetic and real-world datasets. Finally, we collect a novel challenging optical flow dataset by applying our technique on data from a high-speed camera and analyze the performance of the state-of-the-art in optical flow under various levels of motion blur. Wulff, J., Sevilla-Lara, L., Black, M. J. The optical flow of natural scenes is a combination of the motion of the observer and the independent motion of objects. Existing algorithms typically focus on either recovering motion and structure under the assumption of a purely static world or optical flow for general unconstrained scenes. We combine these approaches in an optical flow algorithm that estimates an explicit segmentation of moving objects from appearance and physical constraints. In static regions we take advantage of strong constraints to jointly estimate the camera motion and the 3D structure of the scene over multiple frames. This allows us to also regularize the structure instead of the motion. Our formulation uses a Plane+Parallax framework, which works even under small baselines, and reduces the motion estimation to a one-dimensional search problem, resulting in more accurate estimation. In moving regions the flow is treated as unconstrained, and computed with an existing optical flow method. The resulting Mostly-Rigid Flow (MR-Flow) method achieves state-of-the-art results on both the MPISintel and KITTI-2015 benchmarks. Zhang, C., Pujades, S., Black, M., Pons-Moll, G.
We address the problem of estimating human body shape from 3D scans over time. 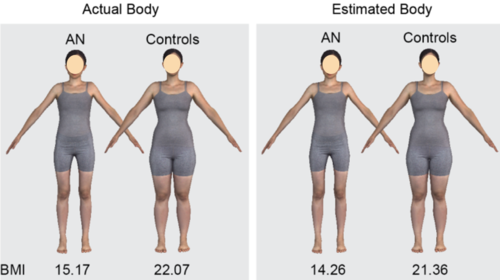 Reliable estimation of 3D body shape is necessary for many applications including virtual try-on, health monitoring, and avatar creation for virtual reality. Scanning bodies in minimal clothing, however, presents a practical barrier to these applications. 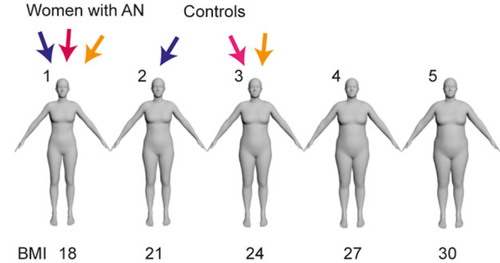 We address this problem by estimating body shape under clothing from a sequence of 3D scans. Previous methods that have exploited statistical models of body shape produce overly smooth shapes lacking personalized details. In this paper we contribute a new approach to recover not only an approximate shape of the person, but also their detailed shape. Our approach allows the estimated shape to deviate from a parametric model to fit the 3D scans. We demonstrate the method using high quality 4D data as well as sequences of visual hulls extracted from multi-view images. We also make available a new high quality 4D dataset that enables quantitative evaluation. Our method outperforms the previous state of the art, both qualitatively and quantitatively. Zuffi, S., Kanazawa, A., Jacobs, D., Black, M. J. There has been significant work on learning realistic, articulated, 3D models of the human body. In contrast, there are few such models of animals, despite many applications. The main challenge is that animals are much less cooperative than humans. The best human body models are learned from thousands of 3D scans of people in specific poses, which is infeasible with live animals. 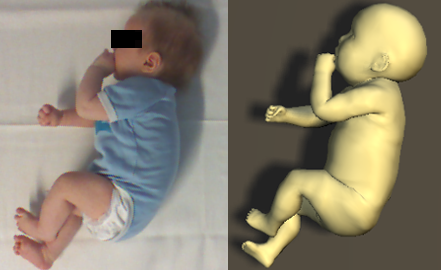 Consequently, we learn our model from a small set of 3D scans of toy figurines in arbitrary poses. We employ a novel part-based shape model to compute an initial registration to the scans. We then normalize their pose, learn a statistical shape model, and refine the registrations and the model together. In this way, we accurately align animal scans from different quadruped families with very different shapes and poses. With the registration to a common template we learn a shape space representing animals including lions, cats, dogs, horses, cows and hippos. Animal shapes can be sampled from the model, posed, animated, and fit to data. We demonstrate generalization by fitting it to images of real animals including species not seen in training. 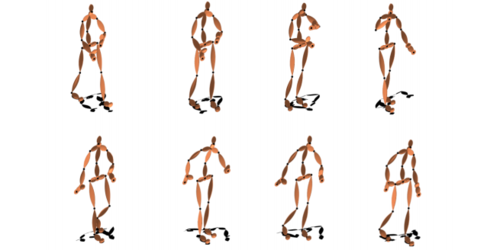 Bütepage, J., Black, M., Kragic, D., Kjellström, H.
Generative models of 3D human motion are often restricted to a small number of activities and can therefore not generalize well to novel movements or applications. In this work we propose a deep learning framework for human motion capture data that learns a generic representation from a large corpus of motion capture data and generalizes well to new, unseen, motions. Using an encoding-decoding network that learns to predict future 3D poses from the most recent past, we extract a feature representation of human motion. Most work on deep learning for sequence prediction focuses on video and speech. Since skeletal data has a different structure, we present and evaluate different network architectures that make different assumptions about time dependencies and limb correlations. To quantify the learned features, we use the output of different layers for action classification and visualize the receptive fields of the network units. Our method outperforms the recent state of the art in skeletal motion prediction even though these use action specific training data. Our results show that deep feedforward networks, trained from a generic mocap database, can successfully be used for feature extraction from human motion data and that this representation can be used as a foundation for classification and prediction. Loper, M., Mahmood, N., Black, M.
A method for providing a three-dimensional body model which may be applied for an animation, based on a moving body, wherein the method comprises providing a parametric three-dimensional body model, which allows shape and pose variations; applying a standard set of body markers; optimizing the set of body markers by generating an additional set of body markers and applying the same for providing 3D coordinate marker signals for capturing shape and pose of the body and dynamics of soft tissue; and automatically providing an animation by processing the 3D coordinate marker signals in order to provide a personalized three-dimensional body model, based on estimated shape and an estimated pose of the body by means of predicted marker locations. Black, M. J., Guan, P.
Systems, methods, and computer-readable storage media for simulating realistic clothing. The system generates a clothing deformation model for a clothing type, wherein the clothing deformation model factors a change of clothing shape due to rigid limb rotation, pose-independent body shape, and pose-dependent deformations. Next, the system generates a custom-shaped garment for a given body by mapping, via the clothing deformation model, body shape parameters to clothing shape parameters. The system then automatically dresses the given body with the custom- shaped garment.